The Family Court Building in Philadelphia, PA. 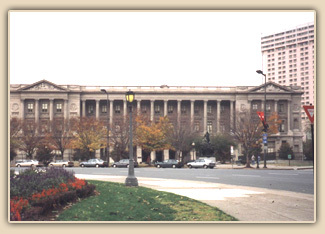 The Family Court Building of the City of Philadelphia was constructed between 1938 and 1940. Its design, by W.R. Morton Keast and John Windrim, reflects the classical influence of the École des Beaux-Arts. Its interior was finished with bold decorative schemes of bright stenciled colors and earth tone glazes to create an atmosphere of sympathy and warmth. In the four principal courtrooms, the coloration was designed in harmony with thematic and inspirational murals. Welsh Color & Conservation, Inc. was asked by the City of Philadelphia to advise on the restoration of the original finishes during a general rehabilitation and systems upgrade of the building. We determined that in all spaces, the original finishes on the cornices and ceilings had never been overpainted, but their appearance was extensively altered due to the accumulation of 60 years' worth of atmospheric dirt, soot and grime. We recommended that the client consider careful cleaning and conservation of the unique 1930s decorative painting rather than covering it over and reproducing it. They agreed to our experimenting with a number of cleaning agents to test which one would be successful in removing the dirt without damaging the integrity of the original paint surface. 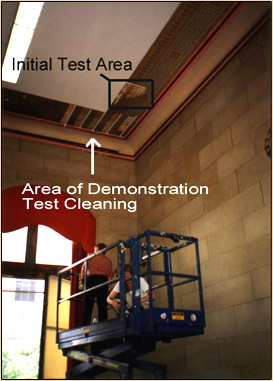 The photographs above depict a courtroom ceiling before and after the test cleaning effort. Our initial testing of a variety of cleaning agents and techniques began in a small area in one courtroom, circled in the preceding photograph on the right. Five of the most promising were selected for a larger demonstration area across the entire width of the stenciled decoration. The areas were identified and taped to keep them uniform. These are illustrated in more detail in the following photo. Demonstration test cleaning of original painted stencil decoration of the ceiling of a courtroom. Note that the original paints on the flat ceiling area and the moldings have been overpainted. 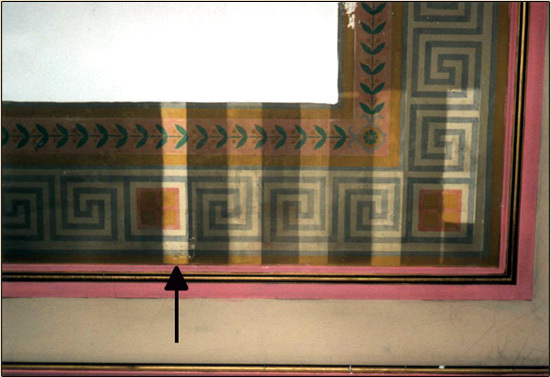 The first test area in the photo (arrow) illustrates how clean and bright the original stencil can appear with gentle cleaning using a 5% solution of diammonium citrate, a chelating agent, in water. In comparison to the other areas it provides exceptional results. It does not overclean or blanch the paint surface. We tested the same 5% diammonium citrate solution on the ceiling decorations in all four courtrooms and obtained the same positive results. Since the results of the test cleaning were so positive, we recommended that the client proceed with plans to clean and conserve the decoratively painted ceilings in one of the smaller courtrooms, along with a proper cleaning and conservation treatment of its mural. 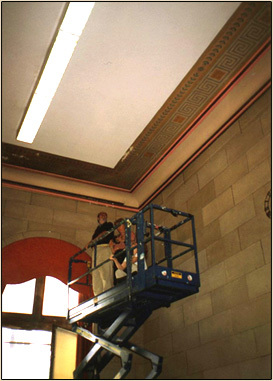 The initial work would serve as a model to evaluate procedures, techniques and results, as well as costs, as part of the overall restoration and repainting of that courtroom. This would involve a well-synchronized, multi-step process of protecting the decorative painting and the mural, repairing the damaged cornice plaster, and cleaning and inpainting areas of paint loss in the decorations. Evaluating and matching colors for the surrounding plaster moldings that have been overpainted will be done in a way that will avoid mismatching old vs. new when repainting the room. Welsh Color & Conservation, Inc. has requested to carefully monitor and supervise the work throughout the restoration. We feel that this case study is, more than likely, applicable to many other monumental public buildings, such as courthouses, custom houses, schools, theaters and auditoriums all across America. Priority should be given to make every effort to save and conserve the decorative painting of the early 20th century, rather than to hastily paint over and reproduce it. Copyright Welsh Color & Conservation, Inc. ©2008. All Rights Reserved.